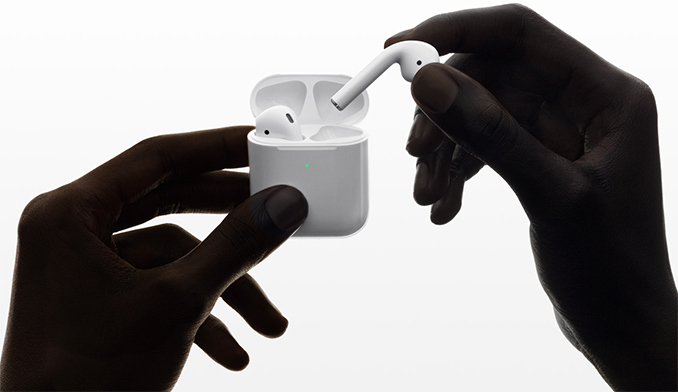 Apple on Wednesday introduced its 2nd Generation AirPods. 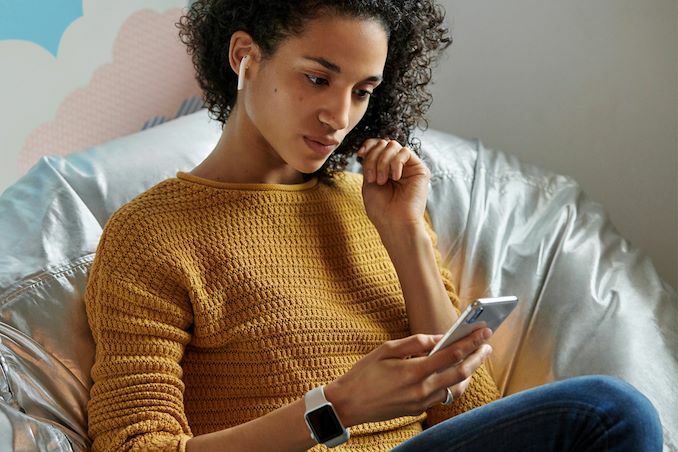 The new AirPods supports hands-free ‘Hey Siri’ functionality, a longer battery life for coversations, and faster connect times. The new headset will be available in both wireless and wired charging cases. 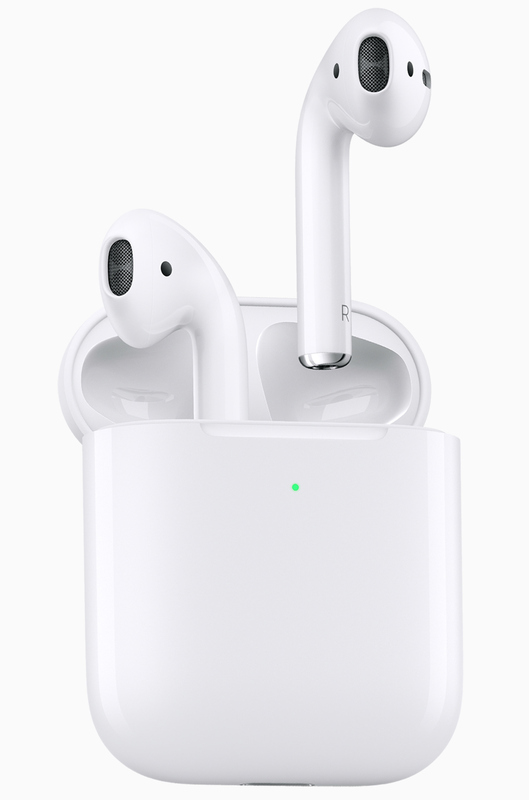 The 2nd Gen Apple AirPods use the company’s new Apple H1 (Hearable 1?) SoC that is said to be considerably faster and more energy-efficient than its predecessor, the Apple W1. In particular, Apple says that the new AirPods deliver up to 50% more talk time and can switch between devices (iPhone, Watch, iPad, etc.) two times faster when compared to the 1st Gen AirPods. Furthermore, the new wireless headset supports hands-free ‘Hey Siri’ functionality enabling users to make phone calls, ask for directions, or simply change songs without touching anything. While the new AirPods deliver up to 50% more talk time, Apple says that their listening time on one charge will remain at about 5 hours, whereas their battery life with a charging case (that holds multiple charges) will remain at about 24 hours, which is similar to what the 1st Gen AirPods offers. Apple did not disclose more precise specifications of the device (e.g., frequency response, etc.). Apple will supply its 2nd Gen AirPods in two versions. The budget model will come in a standard wired charging case and will cost $159. The more expensive model will come in a wireless charging case and will be priced at $199. Both versions will be available starting next week from Apple.com. The wireless charging case will be available separately for $79. That seems to fly in the tech industry. In one of my other hobbies, I can buy a controller that is wired, or one that is wireless. The wireless one is about $50 more. If I buy the wired one today, I can send it back later and get it upgraded to the wireless version for - hold on to your hats - $50. Only penalty I pay for not going wireless from day 1 is I have to send the thing away for 2-3 weeks and I have to pay 1 way postage. @rrinker: We're talking about completely different things. The idea was the wired case + headphones cost $160, the wireless case + headphones cost $200. But the case individually will be $80. Sttm so "aptly" did the math and concluded the $80 wireless case will be twice as expensive if you buy it later/separately because for him it's exceedingly difficult to realize that the $40 difference is just between a wired and wireless case, so basically the wireless circuitry, NOT THE WHOLE CASE. My real complaint here is there doesn't seem to be any real improvement at $159. This would be more compelling of a purchase IF they just included the wireless charging case they've been talking about for almost 2 years.